Stand straight, relax your neck and suspend the head naturally erect from the crown point without strain or tension. The image to model is “hanging by a string from the top of one’s head” such that the head and neck align by the force of gravity alone. 2. Correct position of chest and back. The chest is kept slightly depressed inward which helps enables one’s breath to sink to the lower belly. The upper back is slightly bowed outward while the pelvis is tucked under. 3. Remain relaxed with no tension. Relax and loosen all the joints, particularly the shoulders and elbows, and sink them so that they are flexible, connected and are able to integrate into proper structure. Relaxed does not mean limp. Proper structure is held with a minimum of muscular exertion with gravity providing the downward stacking, providing power from the root into the ground. Tai Chi transfers energy in the form of a vibration much like a whip which has no tension. When the musculature and joints are relaxed, aligned, and connected the wave or pulse of the movement is conducted through them with no retained tension. 4. All movement comes from the center. The waist is the “ruler.” All movement comes from the waist, whether it is a hand movement or a step. Make the waist cause each movement . The waist as the “ruler” must be relaxed, initiating, controlling, guiding and distributing the direction and amount of energy transmitted. 5. Harmonize the upper and lower parts of the body. The vibration of any Tai Chi movement roots at the feet, releases from the legs, is controlled by the waist, moving eventually through the back and arms and finally is expressed by the fingers. To achieve this coordinated path first requires that the feet are at all times firmly attached to the ground like big roots of a tree. The knees must remain slightly flexed. Finally, the upper and lower body must move harmoniously so that all parts of the body are strung together without the slightest break. 6. The entire body moves as a single unit. 7. All movements are performed in a smooth manner, with no unevenness, and continuous, allowing no interruptions. All Tai Chi movements are performed smoothly and evenly. This means that the movements in training never speed up and then slow down. There is never a detectable start and finish from one form to the next. A common image used is that of reeling silk thread from a cocoon. Reeling too fast or suddenly will break the silk while reeling too slow or in the wrong direction may tangle it. 8. Maintain the clear distinction between substantial and insubstantial. Agility is the result of non-double weighting. This means that one’s weight is never maintained equally over both legs. One leg is always heavy and one leg is light. By only maintaining one point of substantial contact with the ground you gain the ability to move quickly, much like a ball which moves easily across the ground because it only has one point of contact with it. 9. Breathe deeply from your lower belly and in harmony with the movements. The breath is deep and full, filling oneself from Tan tien (2-3 inches below your navel.) Each movement is linked precisely with the breath, so that as one expands the body, there is an exhale, and when one contracts the body, there is a inhale. Since the breath is linked to very slow movements, your breathing will also be very slow. 10. The mind leads the body. In Tai Chi, one focuses the attention on the mind, instead of on force. Therefore, use your mind to direct your movements, and let the body follow. Keep the mind fully conscious, aware, and with intent along each and every tiny point along the path of the movement and each point of the body. The mind and breath are king and queen and the bones and muscles are the court. Thirteen Postures does not mean thirteen different postures or movements. Actually it means thirteen basic skills; and moreover, it means thirteen basic attributes for advance study. They are the foundation of all Taiji Quan skills. It is said all other skills come from the different variation and combination of these skills. It is a combination of the 8 basic hand positions and 5 basic stances, 8+5 = 13. The thirteen postures are the main essence and fundamental structures of Taiji Quan. Peng, Lu, Ji, and An are the four straight (e.g. principal compass) directions. They are called Sizheng. Si means four. Zheng means straight, upright, pure, middle, normal, main and positive. It also means fixed or unchanging which means it is not influenced by the others. Thus, Sizheng skills are the main things in hand skills. In Eight Trigrams theory, these four straight directions correspond to four of the trigrams: qian (heaven), kun (earth), kan (water) and li (fire) respectively. These 4 diagonal directions Cai, Lie, Zhou, and Kou are the four diagonal directions and they correspond to the trigrams of xun (wind), zhen (thunder), dui (lake) and gen (mountain). They are called Siyu. Yu means diagonal or sideway. They can be changed. They assist or supplement the hand skills of Sizheng. Peng, lu, ji, an, cai, lie, zhou and kao are referred to as bafa (Eight Methods), as they represent eight different kinds of fighting techniques. These eight fighting techniques equate to eight kinds of jin (power manifestation) patterns that correspond the eight positions of Bagua. There are eight typical methods for Bafa practice. For beginners learning them is very important because it is the way to understand Bafa. To study correct movements is the first step of the practice. Then one should understand how to apply the mind in practice because in advance study movements should always follow the mind. Bafa should be practiced very carefully and for a long time. Pay great attention to every detail. For advance study, the physical movements are not important. Internal details should be focused upon. To master the correct use of the mind and to learn how to use the mind to control Qi and jin (trained force) are the basic skills. Peng means to automatically generate barely enough force by using the mind to push forward and up; this can keep the key points from being locked or controlled by the opponent. Lu means to follow the opponent’s force and movement to move him with a slight change of direction: it is like unloading his force from your body. Ji means to charge straight forward. An means to empty the chest and push diagonally downward. Cai means to control and drop some heavy object down. Lie means to split suddenly. Zhou means a short strike within the reach of the elbow (or elbow circle skills). Kao means a body strike within the reach of the shoulder (or shoulder circle skills). To learn Bafa well, one should understand the relationship of Bagua and Dizhi. Dizhi are twelve characters which are used to record and calculate time and years in the traditional way. In Taiji Quan practice, people use these characters to express twelve key acupoints on the body. The main idea is that from the changing, usually called Chong (conflict) and He (harmony), of these parts of the body the basic jin is generated automatically. Character Zhi is the Mingmen point at the center of the lower back. Character Wu is the Xuanguan point in between the two eyebrows. Character Mao is the Jiaji point at the center of the back. Character You is the Tanzhong point at the center of the chest. Their locations can never be changed. Peng, Lu, Ji, and An come from these fixed points. Thus, they are called Sizheng – four straight directions. The other eight points are on the arms and legs. They are located according to the side of the body that has the weight. When the weight is shifted, these points are changed. Cai, Lie, Zhou and Kou come from these changeable points. Thus, they are called Siyu (four diagonal directions). For example, character Zhi expresses the Mingmen point. Character Chou expresses Huantiao point on the hip which one holds the main part of the weight. When these two points (Mingmen and Huantiao) harmonize, Peng will be generated automatically. In this way, finally the eight methods just become application of the mind. This is the meaning of “use mind, do not use force.” This is what Taiji skills should be. The basic Taiji skills Zhan, Nian, Lian, and Sui are the foundation of Bafa. They should be included in every Bafa application. Zhan means to adhere to something; this means you can make your opponent move and follow you just as if he is adhered to your body. Nian means to stick; this means you can follow your opponent, like sticking on his body, giving him some trouble. Lian means to link and connect; this means you can follow your opponent and never let him leave your touch. Sui means to follow or comply with; this means you can follow your opponent’s attacking technique keeping contact with him but without his controlling you. When Bafa are applied, all the processes of Ting, Hua, Yin, Na, and Fa should also be included. Ting is listen. It means to feel your opponent, to know what he wants to do. Hua is dissolve. It means to dissolve your opponent’s force and not letting him get you. Yin is seduce. It means to lure your opponent into trouble. Na is hold. It means to control him and keep him in trouble. Fa is launch. It means release force to throw the opponent away or hit him hard. Although they are different skills, in fact they are combined together and are always used together. the body can move to the right position (distance and angle), can the hand skills work well. Thus, it is said Wubu is the foundation of Bafa. 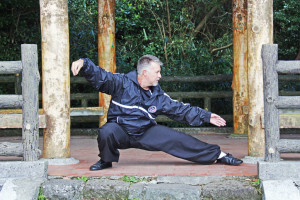 Wubu offers five basic skills which follow the idea of Wuxing, Five Elements. The five footwork skills are listed below. The five steps are qianjin (advancing), houtui (retreating), zuogu (look to the left), youpan (glance the right) and zhongding (central settling). The words “look” and “glance” in “look to the left” and “glance to the right” are merely metaphors used to describe leftward and rightward actions with footwork and body movements. In five elements theory, they correspond to jin (metal), mu (wood), shui (water), huo (fire) and tu (earth) respectively. These five footwork skills train the body to move in the most flexible way during fighting. Jin (or Jinbu – step forward) means to go forward; this really means to close in to the opponent directly. The main idea is how to charge forward. It is water which is like a flood, soft but powerful. It belongs to Shenjin (Kidney Channel). When the key point Huiyin is focused on, the qi will automatically push the body forward. Tui (or Tuibu – step backward) means to withdraw the body; this really means to open a distance from the opponent directly. The main idea is how to move away. It is fire which means hard outside and soft or empty inside. It belongs to Xinjin ( Heart Channel). When the key point Zhuqiao is focused on, the qi will automatically push the body backward. on, the Qi will automatically urge the body to rotate and advance forward. Pan (or Youpan – right look forward to) means to withdraw your body sideways; this really means to open a distance from the opponent indirectly. Here You (right) means sideway; Pan (look forward) in martial arts terms means defensive ideas in withdrawing skills. So the main idea is how to rotate and withdraw sideway with some defence skills. It is usually called rotate withdraw. It is metal which means springy and tenacious. It belongs to Feijin (Lung Channel). When the key point Tanzhong is focused on, the Qi will automatically push the body to rotate backward. Ding (or Zhongding – central equilibrium) means to keep balanced and stable; this really means to keep the central axis of your body stable. The main idea is how to keep the balance so that your body is ready to do anything. The common explanation of Zhongding is to keep Zhongqi – central Qi quiet and stable. It refers to the internal component not physical movement. It is earth which means everything is generated from it. If the balance cannot be kept well, any other skill cannot be done well. It belongs to Pijin (Spleen Channel). When the Dantian is focused on, the Qi will automatically adjust the balance. To understand Wubu, first of all one should understand the relationship of Wuxing and Tian Gan. Wuxing means five elements which express five basic attributes or features of the universe. There is a generation – destruction cycle relationship between the elements. Tian Guan are ten characters which are used to record years and directions. Wuxing and Tian Guan have a mapping relationship. Jia and Yi are in the east and their attribute is wood. Geng and Xin are in the west and their attribute is metal. Ren and Gui are in the north and their attribute is water. Bing and Ding are in the south and their attribute is fire. Wu and Ji are in the centre and their attribute is earth. Taiji skills, how to get close to the opponent is important. Zuan (or Zuanhuan) means Yin and Yang exchanging. It is about how to change steps (footwork) smoothly, quickly, nimbly and stably. Wen means stable or rooted. It is said “stable like a mountain” or “root like a big tree”. Although the ten words are separate words, there is some overlap in meaning among them. In fact they cannot be explained in complete separation from each other. They all should be applied together in Taji Quan practice. were designed under this Taoist principle. Footwork or body movement skills are the foundation of hand skills. To understand this is the key point of application. People always say “hands like a door, fighting depends on footwork”, “thirty percent in hands and seventy percent in step”. It is a very common situation for many people, that maybe they can do fixed step push hands well but they cannot transfer their skills to real fighting. The most important reason is they cannot do footwork and body movement well.